Gelatin is a protein source that comes from an animal product. Organic gelatin comes from farms that use organic practices like avoiding the use of hormones, pesticides or food that contains toxins. An example of this would include grass raised cattle. Organic gelatin can be used as a mix-in for other food or a standalone supplement to be put into capsules. There are many countries in the world including Canda that allow companies to label this product as a treatment for a variety of conditions including joint pain and bone loss. 1. What is Organic Gelatin? 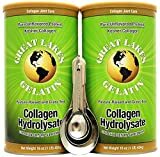 Gelatin is a powder that is made from drying and then grinding up a variety of animal parts to access the collagen inside. This may include skin, bone and soft tissue. Not all gelatin qualifies for the organic label. Organic gelatin labeling means that the animals used to make the gelatin have not been exposed to toxins like hormones, pesticides or other chemicals. Gelatin can be used as a treatment for thinning bones, joint pain and even thinning hair. There are some people who also take it as a weight loss supplement and to encourage healthy nail and hair growth. This product is made from collagen that contains key amino acids. These amino acids serve as a building block for proteins and can add to the healing process or growth process for things like bones, nails, and hair. While you can find standard gelatin at most grocery stores, organic gelatin may need to be ordered online. Amazon carries a wide selection. There are two types of products on this list, the gelatin capsules, and powders. Capsules average about $.05 each sold in packages of 200 or 250. The powders start at $.65 an ounce and go to almost $2,00 an ounce. We compared these products based on Features, Pros & Cons, Where to Buy and Price. There is also some discussion about factors including ease of use and sustainable farming. Powders sold in larger bulk containers start at about $.65 an ounce. These are no frills products meant to be used long-term. Companies marketing to specialized markets like women offer more flexible packaging like a sample size but are also more costly. This organic gelatin is an unflavored product meant to be mixed into a liquid or added to food. It is used to support bone strength, hair and nail growth. While this is certified to be organic, it is also gluten-free, certified Paleo-friendly, and non-GMO. The collagen comes from grass-fed cattle. This product can be found in stores and online for around $28 for a 16-ounce can or $1.75 an ounce. Made from pasture-raised cows, this product is both organic and sustainable. It is also less grainy than many other forms of gelatin, and it dissolves in both hot or cold liquids. Packaging states it is not flavored and most customers prefer to add it to their morning coffee. This product is made from bio-active ingredients and labeled as being 90% pure protein. The packaging has also been redesigned to be easier to use. This product is organic, certified to be Paleo-friendly and also made from pasture-raised bovine. It is also formulated to dissolve in either hot or cold water. CUSTOMER SATISFACTION GUARANTEE: We're confident that you'll love Zint. If you're not satisfied for any reason, we'll give you a full refund within 90 days of your purchase. 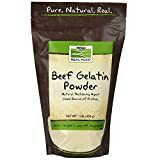 This product is new on the market and a great starting place for anyone who wants to try out an organic gelatin. They even make a trial size that runs $3 for 2-ounces. This is something that sets them apart from other brands. This item is marketed directly to women as it comes in a pink package and is sold as a beauty supplement. JOINTS, HAIR, SKIN, NAILS: Collagen proteins are different from other proteins. 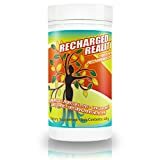 They're vital for joint function and flexibility, muscle tone, energy and endurance, nail and hair growth, skin tone, digestion, liver function, wound healing, detoxification, natural sleep and much more! Bulk, no-frills packaging offers one of the best values as far as organic gelatin goes. The family-owned company has been making this type of product for 40 years and this specific product since 2003. They mean this for long-term use and many customers have a high level of brand loyalty to this company. SOLGAR CLEAN STANDARDS: Solgar strives to formulate products to the cleanest standards. This is not a powder, but instead, capsules filled with gelatin. They may be easier for some customers to use, but the label is confusing. They are sold as being natural vegetable tablets but this only covers the actual enclosure for the gelatin. They are still made from beef. There is also not a clear way to compare a serving size of this product with the daily use of a powder. This product can be found in stores and online for around $15 for 250 capsules or $.05 per capsule. 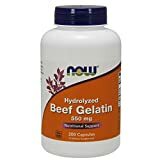 NUTRITIONAL SUPPORT: Beef Gelatin is approximately 90% protein. HYDROLIZED: This hydrolyzed form of Beef Gelatin has been enzymatically predigested to enhance absorption. Another capsule product filled with organic gelatin. This company does a much better job showing the consumer what is in each capsule. This product is made by a family-owned business who also makes it in the powder form. This company is not only sustainable, but it also takes part in recycling programs that focus on environmentally friendly packaging. HIGHEST QUALITY & GREAT PRICE 100% Pure Pasture Raised Grass Fed Beef Type I Collagen Hydrolysate from South American Cattle. Non-GMO, All-Natural, Fat Free, Gluten Free and the best solubility and neutrality on the market. Check our size (500g = 1.1lbs = 17.6oz) when comparing prices! COLLAGEN POWDER HELPS PROMOTE softer clearer skin, healthy joints, tendons, bones, hair, and nails. An anti-aging superfood that's been around for centuries in the form of bone broth. Ancient natural whole nutrition for a healthy gut! 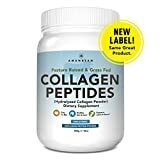 90% + COLLAGEN PROTEIN WITH 18 AMINO ACIDS nurtures a healthy metabolism and can assist in weight loss (protein supplement can suppress appetite) . Excellent addition for high protein low carb, Ketogenic (Keto), Paleo, Primal, GAPS, Whole 30, AIP, and Bulletproof diets. POST WORKOUT COLLAGEN SUPPLEMENT supports joint function and flexibility, lean muscle, energy, endurance, and recovery time after exercise. High bioavailability, no lactose or dairy! 90 DAY SATISFACTION GUARANTEE Fuel your workouts. Heal your body. Look your best. 100% pure bovine collagen, a great alternative to whey protein. This formula is odorless, colorless and made to work in both cold and hot liquids. It is a fine powder instead of a more granular texture. It is also certified to be all natural without GMOs, fat or gluten. This is another supplement that is certified Paleo-friendly and grass-fed. This is the second product by NOW Foods to make this list. This is their bulk packaged gelatin powder. It is by far one of the best-priced products on the market. Again this is made by a family-owned business with value and sustainability in the forefront of the brand. Tasteless, Odorless and Easily Mixes in Any Liquid (Hot or Cold). There is no taste to it AT ALL, it blends right into coffee, tea, orange juice, V8 or smoothies and it's packed with pure protein. 1 scoop into your favorite hot or cold beverage is all that's needed. It will relieve dry cracking skin. Can remove laugh lines and crows feet around the eyes. Novelty packaging and the use of grams instead of ounces on the container is a little off-setting. They may market this product for a different population than many of the others listed here. The product is certified to be an organic gelatin and also easy to mix into both cold and hot liquids. There is no taste, odor or color added to this product. This product can be found in stores and online for around $30 for 448 grams. Both products made by NOW Foods offer customers a budget-friendly product without fancy packaging or labels. The trade-off in the lower cost brings long-time customers back year after year. The fact that they have been in business for 40 years adds to their credibility. Custom Collagen is also another long-term member of this market. Both companies are family-owned businesses that strive to be sustainable. Several newcomers to the list also peaked our interest. Zint seemed to take organic gelatin powder out of the health food stores and into the beauty department with its pink packaging and sample size options. This was a nice addition to the market and a fresh way to look at the product. It is clear they mean this product to grab attention for the beauty supports it can offer. One product that left us a little confused was the capsules sold by Solgar. The package made it seem like the product may not include animal-based ingredients, which is not the case. Each product on this list is made from bovine. All the other nine products make this clear in the event that a customer has a bovine allergy or is vegan. Marking their products as being both dairy free and vegetable tablets seem to point to a lack of animal products.